Maybe you're familiar with the high quality systems made by APEC. They make several different models, and it can be a little confusing trying to decide which one meets your needs. I'm going to give you the scoop on four of the most popular models - how they're alike and how they differ in quality, features, and price. By the end it should be pretty clear which one is the best choice for you. In a hurry and just want to know the current price of APEC filters at Amazon? Click here. You can click on a question in the quick navigation if you like, or just scroll down and read the whole review. How Do APEC Systems Work? What Contaminants Do They Take Out of the Water? What Are the Features of the Different Models? What Comes With a System? All of the reverse osmosis systems work in basically the same way to produce pure, great-tasting water. They all connect to your cold water plumbing. It's the water pressure that makes the water travel through the filters. The water goes through a series of filters that remove things like dirt, chemicals, and unpleasant odors and tastes. Next it enters a reverse osmosis membrane filter where contaminants like viruses, bacteria, and heavy metals are filtered out. The waste water, or brine, goes down the drain and the purified water empties into a holding tank. One model, the RO-CTOP, doesn't use a holding tank. Instead, the water goes directly from the reverse osmosis filter out the dispensing tube. For all other models, the water stays in the pressurized tank until you turn on the faucet. The water gets a final filtering on the way out to get rid of any residual taste from the tank. And, the ROES-PH75 also provides an extra shot of calcium at the end to raise the pH. undesirable chemicals and minerals like chlorine and fluoride. All that's left at the end of the filtering process is clean pure water. I think the best way for me to answer this is first describe APEC's best selling system, the RO-90. Then I'll compare the others to it. The RO-90 is a 5-stage system. 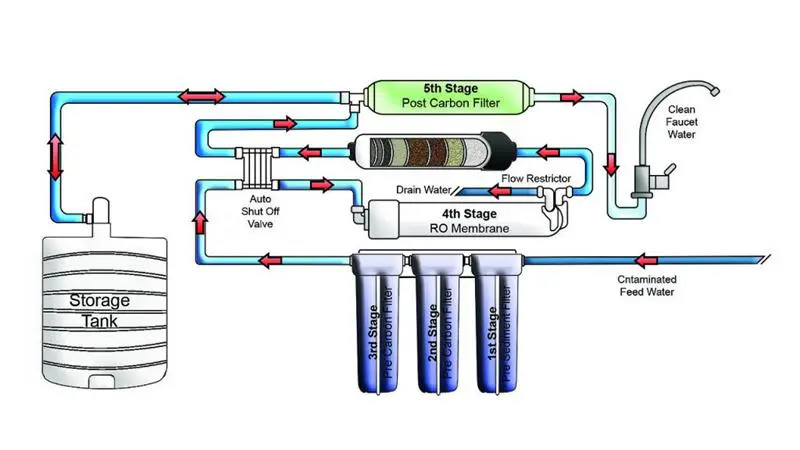 That is, the water goes through the 3 pre-filters (Stages 1, 2 and 3) and the reverse osmosis membrane (Stage 4) before emptying into the holding tank. Then it goes through one final filter (Stage 5) on the way to the faucet. All of the filters and the tank go under your kitchen sink and connect to the high quality chrome faucet that comes with the system. The tank measures 11" x 11" x 15" and the system is 16" x 5.25" x 17.5". The RO-90 is WQA Gold Seal certified, which means that it's been thoroughly tested and meets industry standards. The output of this model is 90 gallons per day at a water pressure of 60 psi and water temperature of 77 degrees F.
So it produces plenty of water for a typical household on municipal water. Check the price at Amazon by clicking here. I did a complete review of the RO-90 which you can read h﻿ere. 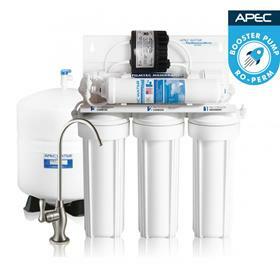 This filter system is designed for homes with low water pressure (30-50 psi). Your pressure might be low because you're on a well. Or maybe you just live in a part of town that doesn't have good water pressure. Whatever the cause of the problem, this is a great solution for you. It's actually able to fill the holding tank 2-3 times faster than the RO-90. The extra pressure also makes the water come out of the faucet faster. The pump works by the hydraulic energy of the brine water going to the drain. It doesn't use electricity, so you don't need to worry that the filter won't work if the power goes out. The pump also cuts down on the amount of waste water going down the drain - up to 80%! Like the RO-90, the RO-PERM can put out up to 90 gallons of purified water a day. And it's WQA Gold Seal certified, too. Unlike the other models, the RO-CTOP sits on top of the counter. It's perfect for RVs, apartments or rental homes where you might not want a full-blown installation. It only weighs 7 pounds and doesn't take up much space - 14" x 6.5" x 6", so you could easily take it with you when you travel. Getting the water into the filter is a little different for this one. You attach it to your kitchen sink faucet with a special adapter provided with the system. Then you turn on the cold water and the filter does its magic. The adapter also has an outlet for the waste water. This one is a 4 stage system. Because there's no holding tank, there's no need for a fifth filter. After the water passes through all four filters, it goes straight out the dispensing tube and into your glass or container. The water typically doesn't come out very fast. Some people describe it as a trickle. Of course, the stronger the water pressure, the faster it will filter. RO-CTOP is rated to put out 90 gallons of water a day at 60 psi and 77 degrees F. That's the same as the RO-90. Like all models, the water pressure and temperature have a direct effect on the output rate. Check the price of the APEC RO-CTOP at Amazon by clicking here. Reverse osmosis can slightly lower the pH of your water, making it more acidic. Usually it's such a tiny amount that you wouldn't know it. But, if this is of concern to you, then you should consider the ROES-PH75. 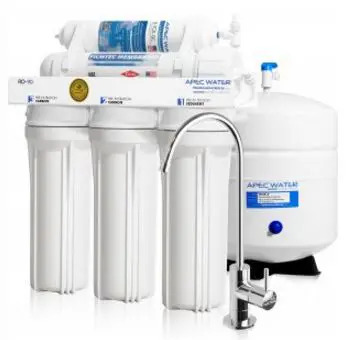 APEC has added a 6th Stage to this system as a solution for people who want more alkaline water. It has a calcium carbonate filter that remineralizes the water and raises the pH. This model is one of APEC's lower priced Essence systems. It's not WQA certified, but it's still guaranteed to eliminate up to 99% of the contaminants in your water. It's not much different in size to the RO-90 and takes up about the same amount of space under the sink. The system capacity is a little smaller than the RO-90. It's 75 gallons per day at 60 psi water pressure and 77 degrees F.
APEC makes it easy for you to do it yourself. Every system comes with very detailed installation instructions. The average person can have it up and running in an hour or two. And if you need help, APEC's very helpful customer service is just a phone call away. Yes. APEC offers a 1-year warranty on all parts except for used replaceable filters. I always recommend checking first at Amazon. If you're an Amazon Prime member, your purchase might qualify for free shipping. Sometimes the manufacturer runs promotions, but you're going to have to pay for shipping. The cost can be pretty steep depending on where you live. 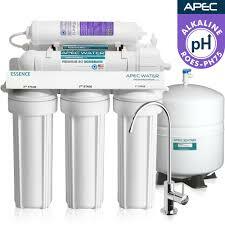 APEC makes the highest quality reverse osmosis systems around, and I wouldn't hesitate to recommend any of them. They all do a super job of removing every kind of contaminant and producing the best tasting water possible for your drinking and cooking needs. Before ordering, it would be a good idea to test your water pressure. If it's low, you'll want the RO-PERM - the one with the extra pump. If you don't want to have to install a system or want one that's easy to pick up and take with you, consider the RO-CTOP. Just keep in mind that flow rate is much slower than the installed models. If your preference is to add calcium back into the water to make it more alkaline, you'll want to go with the ROES-​PH75. Finally, if you have good water pressure and you aren't concerned about the pH of the water​ and you want an installed system, the RO-90 will be your best choice. ​Click here to go to Amazon to check availability and current prices. Want to check out some other brands of reverse osmosis systems? Please see The Best Reverse Osmosis Systems for 2019.